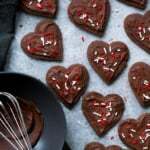 Remember that paleo chocolate cake I made last year for Valentine’s Day? Well I may have just made a cake even better than that. That’s right, I’d like you to meet my Grain Free Tahini Chocolate Chip Cookie Cake. Isn’t she beautiful? You might be wonderful what exactly makes this cake so special? 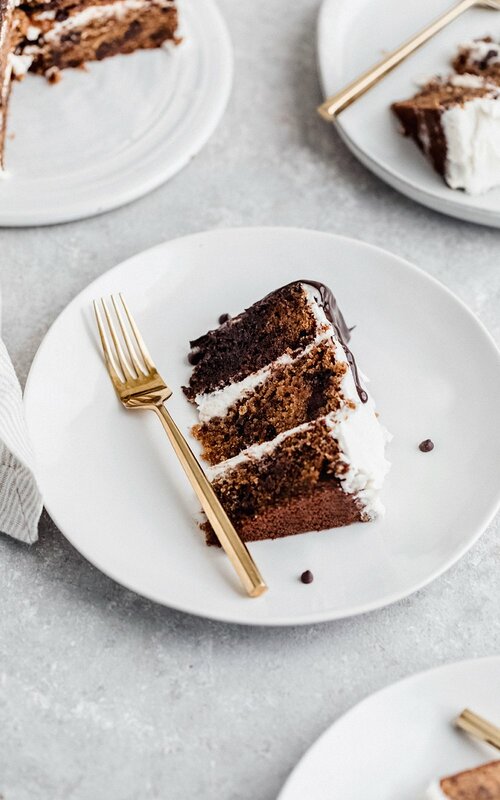 Just imagine biting into cake that tastes like a chocolate chip cookie filled with notes of caramel flavor, vanilla and brown sugar. 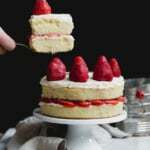 Then topped with a smooth, fluffy vanilla buttercream (that’s easily made dairy free or vegan). BOTTOM LINE: IT BASICALLY TASTES LIKE A CHOCOLATE CHIP COOKIE ICE CREAM SANDWICH and it just so happens to be grain free, easily dairy free, and SO FREAKING GOOD I COULD DIE. Sorry for all the caps, but it’s necessary when I really need to get my point across. I hope you’ll forgive me. Now I don’t want to brag, but I’m pretty proud of myself due to the fact that I nailed this grain free tahini chocolate chip cookie cake the very first time I made it. Of course, that doesn’t mean I didn’t bake it FIVE more times just to be sure. After all, you know when I deliver a recipe that I always want to make sure it turns out incredible. Before we talk about the ingredients, I want to chat quickly about ingredient substitutions because I tend to get a lot of questions about what you may be able to change. I have only tested the cake as is, so please know that if you make substitutions you are doing so at your own risk! Almond Flour: I love using blanched super fine blanched almond flour in this cake to help create the most perfect texture and flavor. If you are allergic to almonds, hazelnut flour or cashew flour would be great substitutions, but please know the flavor will change. Also, please remember to pack your almond flour just like you would if you were using brown sugar. Coconut Flour: this helps to absorb moisture and create a nice fluffiness to the cake. If you are looking for a substitution I think that a gluten free oat flour might work well. Tahini: have I mentioned how obsessed I am with tahini and how you should be too? It creates the BEST flavor in this cake and when paired with the almond flour and coconut sugar, it is amazingly delicious. Tahini is just ground up sesame seeds aka sesame seed butter! Please do not substitute tahini, it has a unique texture and flavor compared to other nut/seed butters. Eggs: four eggs are used in this recipe, which creates the perfect level of fluff with still a little density so that it resembles chocolate chip cookie texture. I have not tried flax eggs, but I think it would work well, just make sure you let them sit in the fridge to really gel up for at least 10 minutes before using them in this recipe. Remember 1 egg = 1 tablespoon flaxseed meal + 3 tablespoons water. 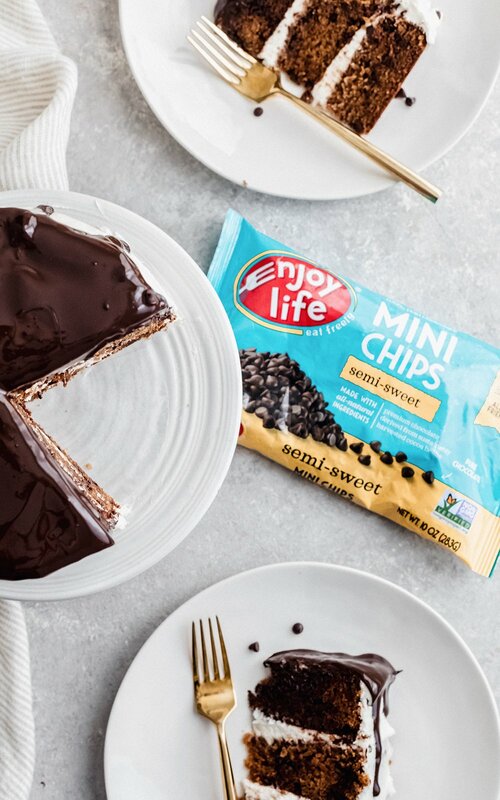 Enjoy Life Foods Mini Chocolate Chips: dare I say best chocolate chips ever?! 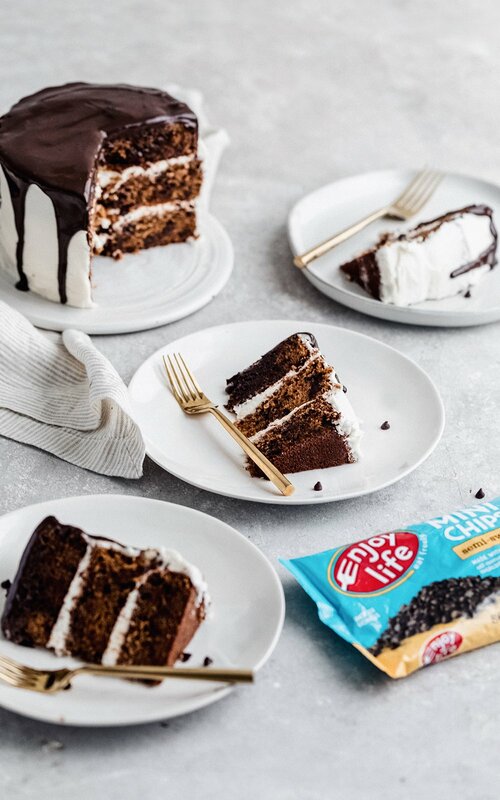 I love using Enjoy Life chocolate chips in my recipes because they’re allergy friendly and delicious! I used their mini chocolate chips in this recipe to ensure you get a bite of chocolate in every single bite you take. It’s also what’s used in the chocolate drip glaze. Seriously SO dang good. Vanilla Buttercream: this is one of my favorite buttercreams to make simply because it’s so fluffy, perfectly sweet and reminds me of vanilla ice cream. It’s made with just butter, vanilla and powdered sugar. If you really want to amp up the vanilla flavor, you could add in vanilla beans but I think it’s lovely as is. To make the frosting vegan/dairy free: use a vegan buttery stick. Simple Mills frosting is also another great option. 1.) Make sure you allow the cakes to cool completely before frosting. This is critical! 2.) Feel free to use a store-bought frosting like Simple Mills if you don’t feel like making frosting. 3.) This cake should be stored well-covered in the fridge after a day or so. The cake will last 5 days. 4.) Don’t forget to pack your almond flour. Do NOT pack the coconut flour. 5.) Tahini is common in most grocery stores. Sometimes it’s by all the other nut butters and other times you can find it in the global foods section. I hope you love this cake as much as my husband did. It’s officially one of his favorite desserts I’ve ever made, and that’s saying a lot since he really enjoys to rate and critique my recipes! If you make this recipe, please leave a comment and rate the recipe below. This helps us tremendously! You can also tag #ambitiouskitchen on Instagram so I can see your creations. Xo! 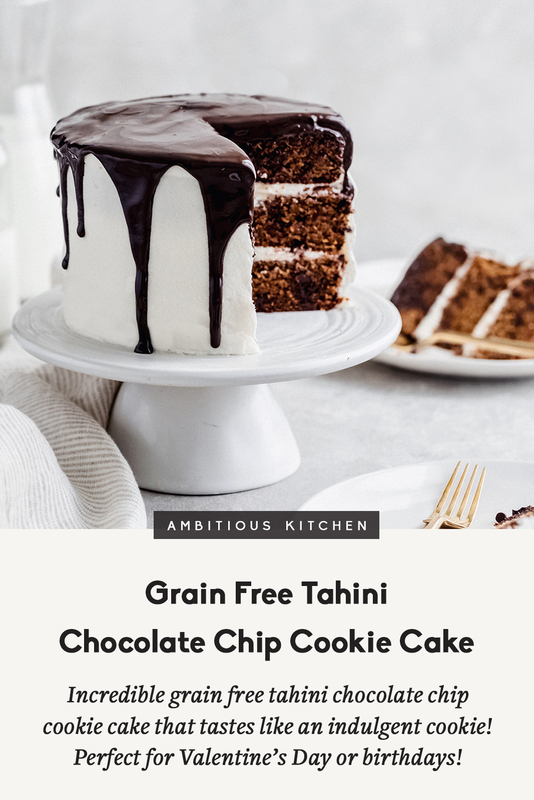 Gluten Free and Grain Free Tahini Chocolate Chip Cookie Cake that tastes like an ice cream cookie sandwich in cake form! Hints of caramel, vanilla and chocolate flavor baked into every single bite then topped with a fluffy very vanilla buttercream. This cake can easily be made dairy free and is perfect for special occasions, birthdays and holidays! In a large bowl, whisk together the eggs, coconut sugar and tahini until smooth. Slowly whisk in the melted and cooled coconut oil until it’s well incorporated. Then stir in the almond milk, vanilla and almond extract. The mixture should be smooth and well combined. Note: It is important that your eggs are at room temperature otherwise the coconut oil with coagulate. The coconut oil should be melted but not HOT, but rather closer to room temp. 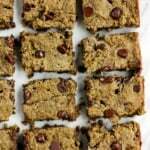 In a separate bowl, whisk the almond flour, coconut flour, baking soda, salt and chocolate chips together. Add the dry ingredients to the wet ingredients and mix well with a rubber spatula until smooth. Divide batter evenly between pans and spread out with a spatula to smooth the tops. Bake for 18-28 minutes in the two 8-inch pans and 25-35 minutes for three 6-inch pans. Cakes are done when a tester comes out clean or with just a few crumbs attached. Allow cake to cool completely before frosting or removing from the pans. The cake should be room temperature when you frost it. This is very important. Cakes can be made a day ahead if you’d like. Make your frosting: In the bowl of an electric mixer, add the softened butter and whip on high until light and fluffy. Add powdered sugar and vanilla extract and beat for 2-3 minutes more. You may need to add in a teaspoon or two of milk to thin the frosting out, but it depends on how you like it. Now it’s time to frost the cake: place about 1 tablespoon down onto onto the cake stand and spread out. 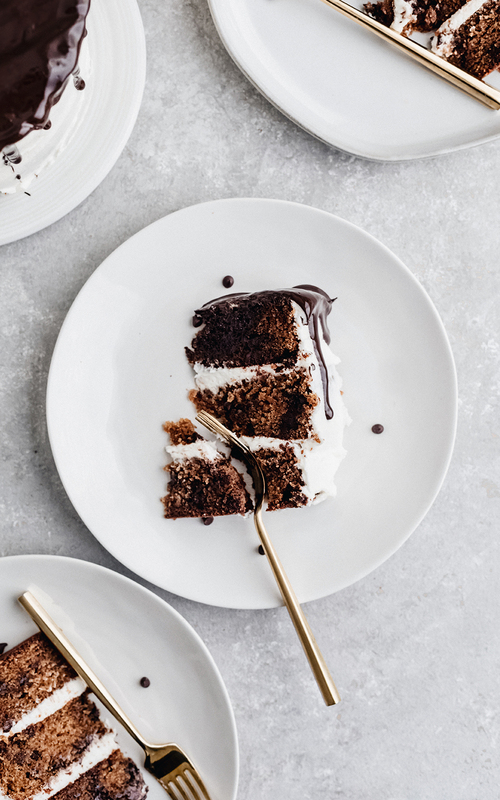 Invert cake onto the cake stand, add about ½ heaping cup frosting between each layer, repeat with each cake, then frost the top and sides of the cake with the remaining frosting. If the cake is slightly ‘naked’ on the outside, that’s okay, it’s going to be delicious! Once you are done frosting, place the cake to the fridge. 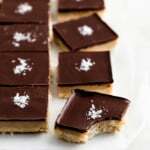 To make the chocolate ganache drizzle: add chocolate chips and coconut oil to a microwave safe bowl. Microwave in 30 second intervals, stirring in between, until chocolate is smooth and completely melted. Remove cake from fridge and pour over the top of the cake. 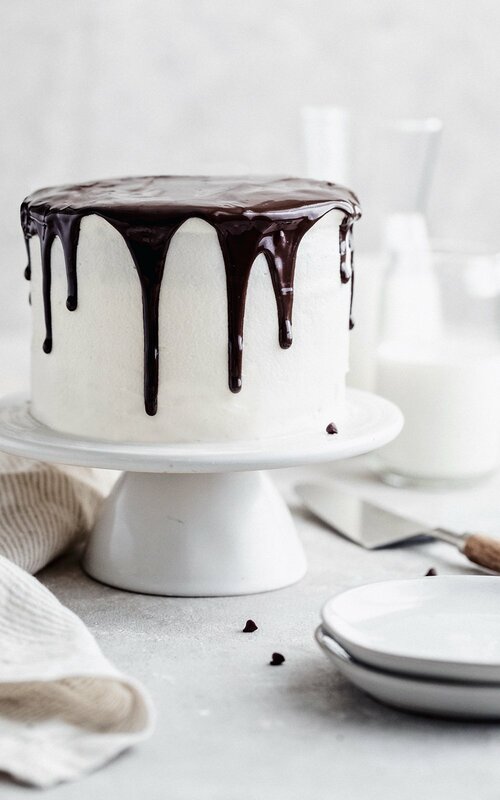 It should naturally start to drip down the sides, but if it doesn’t, use a spoon to spread the chocolate a little towards the sides to create a drip look on the sides. Enjoy! Cake will stay good at room temp for a day or so, then should be placed in the fridge. Cake will stay good for 5-7 days in the fridge, and should be covered to ensure freshness. 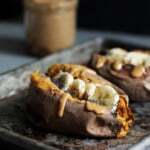 This recipe is in partnership with Enjoy Life Foods. All recipes, text and opinions are my own. Thanks for supporting AK and the brands who make this site possible. 61 Responses to "Grain Free Tahini Chocolate Chip Cookie Cake"
I made this for my grandson’s 15th birthday. No one in family was told it was a grain free recipe. It is my secret!! !My husband is gulten and dairy free so I wanted him to enjoy the birthday. The whole family was WOWED!!!!!!!!!! great site. Your Cake Is A Thing Of Beauty, Everything You Touch Turns Out Beautiful. I Believe It Is What You Are What You Are Made Of And It Overflows In Everything You Do. Monique, this looks INCREDIBLE! You are a genius. Can’t wait to make! 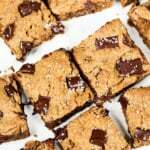 What would you substitute almond flour for (allergies to almonds)! You can sub hazelnut flour! Is there any way I can use a 1 to 1 gluten free flour instead of the almond flour? Unfortunately I wouldn’t recommend it in this recipe! The consistency will be very different as well as the liquid ratios. Oh my gosh! This is so perfect for my gluten free, dairy free boyfriend. Making this asap! Made this last night and it was AMAZING!! I’ve never baked with coconut flour and almond flour before and was so pleased with the results. I will be making this cake again! Thanks, Monique! Wow I can not wait for this!!!!! LOVED the best ev choc cake from last V-day. Silly question, maybe? If i cut all the ingredients in half, that should work to make 1 9″ cake, right? Also, I don’t mean this as a critique in any way, but have you considered listing the steps out in numerical form? I find with your recipes I get lost in the paragraphs over and over trying to find the next step. Thanks so much!! And yes this should work well with 1 9″ cake! Hi there, firstly I LOVE your site! I have made so many of your recipes and they are amazing! I have not actually attempted any of your cakes before but want to try this one or your paleo chocolate cake out for Easter! I have two 9 inch cake tins and wonder how I change this recipe to suit. Is this recipe enough to spread between for two 9 inch tins? if so what would be the baking time? or do you recommend the whole mix be baked in one 9 inch tin? Hi Jessica! So glad you’re loving the recipes here 🙂 The recipe will be enough to spread between two 9 inch tins – they’ll be a little thinner, so just shorten the bake time a bit. Enjoy! 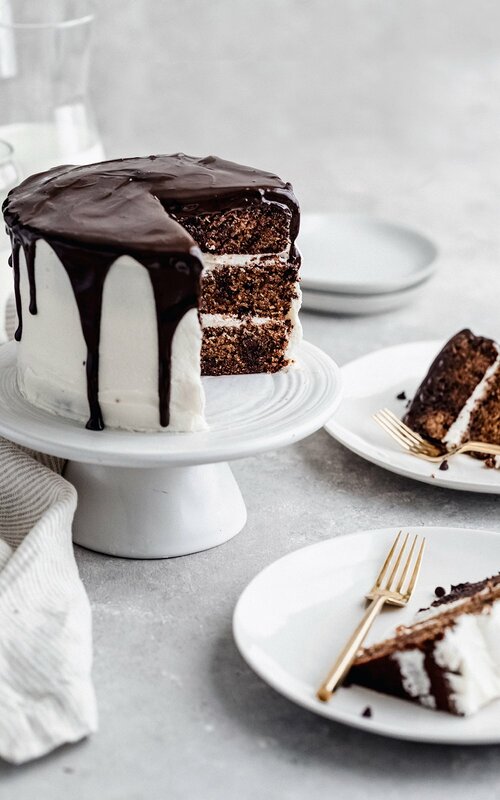 Ah I wish the cake itself is vegan because this looks freaking TO DIE FOR! At least the frosting is easily vegan-friendly. Maybe the recipe can work with an egg replacer? I’d have to test that out someday! Feel free to use flax eggs! This cake was so easy to make and SUPER delicious! Huge hit at my house! This came out sooo yummy!! My family loved it!! Thank you ! Is there something I can use as a sub for coconut sugar that is better for diabetics (both type 1 and 2)? Unfortunately I’ve only made it this way! You could probably try a stevia 1:1 substitute. Glad you enjoyed! And it is meant to be a treat 🙂 but with all real food ingredients! This was amazing! Made it with the vanilla simple mills frosting to save time but will definitely try with homemade next time to compare. It was easy to make and kiddo approved! Perfect! LOVE that frosting. Glad everyone loved it! I made this cake tonight for my son’s birthday and it was amazing. I made the recipe exactly as written and everyone raved about it. This is a perfect celebration cake! I dont know how to break it to you, but what do you think tahini is made of? Yes these can definitely be made into cupcakes. I think it would make 12-18 cupcakes as is. You’ll need to adjust baking time, but I would start with 16-22 minutes. Let us know how they turn out!! Amazing – thank you! Will do! I made this cake for a casual get together last night. It was fantastic! I used 8 inch pans, greased with coconut oil and lined with parchment. I used butter in the cake, and Aroy D coconut milk from a can instead of almond milk (I was cooking Thai food, so there was lots of coconut milk around). For the frosting I followed the recipe, but used coconut milk instead and then added half cup of Kirkland natural peanut butter. This was such a great cake! Thanks Monique. I’ve been loving the tahini recipes. Perfect!! Hope everyone loved it 🙂 and stay tuned for plenty more tahini recipes. I made this cake for my bestie’s Birthday. Everyone LOVED it. It is so good! You’re my go-to for almost every recipe! Thank you. Oh my gosh this looks SO yummy!! I’m going to make it for my daughters dedication luncheon! What do you think about silicone cake pans? I’m wanting to try them for the first time, but since I’ve never tried made recipe I don’t want to mess it up! I wouldn’t recommend it for this cake simply because it’s soft! Wow. Wow. WOW! This cake is INCREDIBLE! I made it for my daughter’s dedication luncheon and everyone was so impressed and couldn’t believe it was made with Tahini. I’m making it again today for a friend’s birthday. I want to make it again for my baby’s 1st birthday, but would like to find a sugar free frosting. Any suggestions of one?! I can’t say enough good about this cake. Perfectly paired with either a mug of coffee or a glass of cold milk. I made it twice in a three week period. Amazing. My husband was skeptical. “It sounds too healthy. 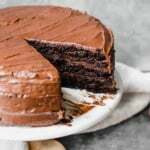 Tahini in cake? !” It’s now his favorite cake and he’s requesting it for his birthday. He does NOT take cake (or any sweets) lightly. His family loved it. Our one year old loved it. SO GOOD! And it was easy. Can I give it more than five stars?! SO happy to hear that Suzie! Thank you for your note 🙂 glad everyone loved this! Just made this last night! So good! Best cake I’ve ever had! Amazing!! I’m glad you loved it!